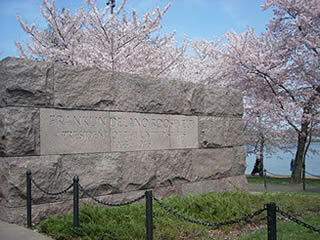 The Franklin Delano Roosevelt memorial was dedicated on May 2, 1997. The monument, spread over 7.5 acres (3.0 ha), traces 12 years of the history of the United States through a sequence of four outdoor rooms, one for each of FDR’s terms of office. Sculptures inspired by photographs depict the 32nd president alongside his dog Fala anddepict scenes from the Great Depression, such as listening to a fireside chat on the radio and waiting in a bread line. It is the only presidential memorial to depict a First Lady, Eleanor Roosevelt.